#JeanieJohnston - Almost a month after returning from essential maintenance in a dry-dock, Jeanie Johnston is still undergoing major work this week but now focused at her stern while moored at her customary Dublin city-centre berth, writes Jehan Ashmore. 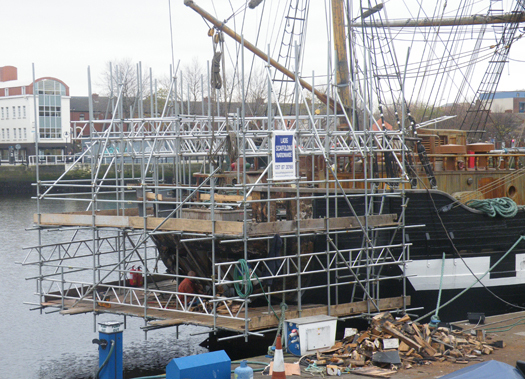 Afloat.ie has attempted several times to contact the operators managing the 19th century replica famine museum ship as to the reasons for the works. Despite these related works which started six weeks ago and during that of her dry-docking period, it is understood that the popular tourist attraction remains open as usual. The museum ship has 45–minute guided tours that tell the story of Irish emigrants fleeing the famine to seek a better life in the New World. As can be seen in the photograph particularly at the poop is where hull timbers have been removed to expose the hull's framework. Having made an inspection from the quayside, it was also noted further exposed hull frames are at the deck below and debris is piled on the pontoon alongside. Is the original structure is to be replicated or perhaps altered to suit new requirements of the tourist attraction which has been a floating museum for more than a decade?